I am Melvin Greer and younger brother of John Dudley Greer. All my life he has simply been known as “Dud”. (that’s a bomb or shell that didn’t go off) or KL7EQQ. Dud was born July 30th at Sabinal, Texas and died July 19, 2013 He went through all grades there and graduated in 1941. Soon after graduation, he finally got the job he wanted at Kelly Field San Antonio and was trained as an aircraft electrician. Since he was needed in Alaska, he was sent there in ’43, got drafted, changed into a uniform and continued to work in the same shop until discharged and put his civies back on. I guess this is about the time he got the HAM bug and he became very adept at it. He had a 70ft antenna there. When Alaska had the earthquake in ’64 Hams were the only source of communications and were used to contact people where ever they could. When he retired, I flew to Alaska and we drove back in his pickup with a camper shell. He had Ham friends everywhere. We stopped in Seattle and stayed with a friend who had his home almost on the water’s edge. We spent the night with a Ranger at Crater Lake another in Farmington NM. Keeping mind they were all Hams. He became like a mentor to younger Hams. He was always urging me to be a Ham because I was first a telegraph operator on the railroad then a CW opr in the Marines. Dud stayed faithful to the cause. His health began to fail while living in Luling, Tx having to have dialysis then finally spent time in a nursing facility. He did quite well there then went to an assisted living home. He was off the air for a short time but friends here got him set to go on the air again. Dudley is preceded in death by his wife Bernice Sincleair Greer (they were married 60 years), and one nephew Tommy Greer. He is survived by his brother Melvin and his wife Glenna, one son Gary Greer of Austin, one nephew Mitch Greer and one niece Amy. As I can look back and see now, how thankful I am that so many people had a liking for Dud. It is easier to just say, he was a good guy. Thanks to Melvin for this information. Dudley was cremated and no services are planned at this time. Thanks to Herschel WB5MEX for letting us know about Dudley. Raymond Dale Hooper, age 86, of Ink, Arkansas died Thursday, July 18, 2013 at the Rich Mountain Nursing and Rehab. He was born on Thursday, September 16, 1926 to Willie Wayne and Eliza Lott Hooper in Mena, Arkansas. Raymond was a true man of God and served his Lord with all his heart. He served in the Gideon Ministry for 56 years. Raymond was a member of the Anointed Faith Tabernacle in Mena. He served his country in the United States Navy during World War II. He worked as a butcher for 20 years at the Swifting Company in Fort Smith. Raymond also was a Ham Radio Operator and enjoying meeting people from all over the world. He has talked to people from over 310 foreign countries over the years. He served as a volunteer fireman for the Ink Fire Department for many years. Raymond was a loving, father, grandfather, brother, uncle and friend, and will be missed by all who knew him. Raymond is preceded in death by his parents, his wife, June Hooper; one son, Stephen Hooper; one brother, James Hooper; and one infant sister. Raymond is survived by his son and daughter in law, Paul and Barbara Hooper of Mena; three brothers, Willard Hooper of Mena, Harold Hooper of Benton and Kenneth Hooper of Mena; three grandchildren, Emilee Langford of Owensboro, Kentucky, Zachary Hooper of Fort Smith and Jordan Hooper of Mena; several nieces and nephews, and a host of other relatives and friends. Funeral services will be Saturday, July 20, 2013 at 10:00 A.M. at the Bowser Family Funeral Home with Brother Wally Beckman officiating. Interment will follow in the Concord Cemetery. Visitation will be Friday, July 19, 2013 from 6-8 P.M. at the Bowser Family Funeral Home in Mena. Pallbearers will be Audrey Cost, Burt West, Bob Pack, Shannon Langford, Zach Hooper and Jordan Hooper. Johnny Henry Davis, Jr., beloved husband, father, grandfather, and great-grandfather, passed away June 5, 2013 after a short bout with cancer. Johnny was born January 21, 1942, in Auburn, Alabama, to Johnny Henry and Ruth Maurine (Black) Davis, Sr.
His family moved to Texas in the 1950's. Johnny became a "Fighting Texas Aggie" graduating with his B.S. degree in Electrical Engineering. He and his wife moved to Richardson, Texas in 1966. While in college, he worked as a camera man for Channel 3, KBTX, in Bryan-College Station. After graduation, his first job was at Collins Radio. His career transitioned from designing microelectronic circuits to being a part of the management team for two voice mail companies. Johnny developed their international distribution networks and made many good friends during his international travels. Johnny's hobbies included ham radio. He was first licensed at age 13 and held the call K5LZA. Later, he changed that call to K5JD. Johnny's skill with Morse code was unparalleled. While attending Radio School in the Army National Guard, Johnny was asked to serve as the assistant instructor his first day in the class since he already excelled in the class curriculum. Johnny also enjoyed traveling with his wife, like working at his computer and visiting with his children, grandchildren, and great-grandchild. Johnny was a member of several different organizations. He served on the Dallas Summer Musicals Guild Board, held many offices in the Dallas Amateur Radio Club, was in REACT, and on the Dallas County RACES Council. He was also an active member of Masonic Lodge Dallas No. 760 as well as several other Masonic organizations. Johnny served many years as the Dallas County RACES Officer. He relayed Weather Spotter reports from the amateur radio nets to various media outlets for reports to the public. He is survived by his wife of 48 years, Mary Ann Davis of Richardson, Texas; children, Johnny H. Davis, III and Tammy Suzanne Sigman; grandchildren, Heather Sherman, Mary Lynn Sigman, and Johnny H. Davis, IV; great-grandson, Kaden Hunter Sigman; sister, Patricia Davis Exner and husband, Jerry; sister-in-law, Priscilla J. Harris; nephews, Ben Exner and William B. Harris, IV; and nieces, Sara Crow and Amanda Staiano. He was preceded in death by his parents, son-in-law, Gregory James Sigman, brother-in-law, William Birch Harris, and grandson, Hunter Michael Sigman. Funeral services will be held at 2:00 p.m., Saturday, June 8, 2013, at Turrentine-Jackson-Morrow Chapel in Allen, Texas with Rev. Johnnie R. Jones officiating. Interment will follow at Ridgeview Memorial Park. The family will receive friends during a visitation from 7:00 - 9:00 p.m., Friday evening at the funeral home. Memorials may be made to Parkinson's Voice Project, 500 N. Coit Rd., Suite 2085, Richardson, TX, 75080. To convey condolences or to sign an online registry, please visit www.tjmfuneral.com. Arthur Walter Louis was born on March 21, 1923 in Milano, Texas to parents Walter and Zelda Blackmon Louis. He was raised in Caldwell, graduated from Caldwell High School and Blinn JR. College with an associate degree. On February 5, 1944 Arthur married the former Miss Dorothy Schavrda in Bellville. He was a member of St. John Lutheran Church in Bellville, Bellville American Legion, 50 year member of Bellville Masonic Lodge. Arthur was an Amateur Ham Radio Operater, W5MMO, tv repair man, tax assessor clerk for Austin County and retired as District Clerk for Austin County. Arthur served in the U. S Navy during WWII as an aviation radio man on a PBY Seaplane. Survivors include his wife, Dorothy Louis of Bellville, daughter, Ann Maher and husband, Ed of Bellville, son, D.A. "Bubba" Louis of Bellville, grandchildren, Lt. Col.Shane Louis and wife Heather, Kevin Louis and wife Shanna, Kimberly Pampell and husband Jason, John Krumrey and wife Jennifer and Travis Maher, great grandchildren, Riley and Maddox Maher, Madison, Morgan and Trevor Louis, Austin and Kolby Louis, Shelby Pampell, Katelin and Carson Krumrey and numerous nieces and nephews. He was preceded in death by his parents, 2 brothers, 5 sisters,9 brothers-in-law, 6 sisters-in-law and 3 nieces. The family wishes to thank, Dr. Bosse and staff, Compassionate Care Hospice and staff, Marilyn Werner, Sharon Graham and the most dedicated and caring care givers, Pat and Charles White, Jackie and David Ward and pastor David Henske and pastor Jennie Jones. Visitation at: Knesek Bros. Funeral Chapel 842 E. Main, Bellville, Texas 77418 5:00 PM until 7:00 PM Tuesday, April 16, 2013. Funeral Services are at 2:00 PM, Wednesday, April 17, 2013 at the St. John Lutheran Church 520 N. Holland Blvd. Bellville, Texas 77418, with Rev. David Henske and Rev. Jennie Jones officiating. Interment in Pilgrims Rest Cemetery. Pallbearers are Pastor Dan Louis, Jr., Lt. Col. Shane Louis, John Krumrey, Kevin Louis, Billy Schavrda, Bruce Noviskie, David Krueger and Jason Pampell. Honorary Pallbearers are Wayne Schavrda, Roger Krueger and Travis Maher. Memorials may be made to St. John Lutheran Church or Compassionate Care Hospice in Bryan, Texas. Shannon - Carl Ballard, 72, died Tuesday, April 9, 2013, at his residence. He was born in Jackson on January 15, 1941, to Ernest Carl and Mary Inez Willis Ballard. He spent over thirty-two years in the military, serving in the Army, Air Force and the National Guard, retiring as a Master Sergeant. An entrepreneur, he was the co-owner, with his late wife, Brenda, of Ballard Furniture. He still found time for volunteering and was a Shriner and a Mason. He was a member of the Tupelo Amateur Radio Club, Call # K5BBA. Services with military honors will be 11 a.m. Friday, April 12, 2013 at The Jefferson Street Chapel of W. E. Pegues with Rev. Phil Wood officiating. Burial will be in Lee Memorial Park. Survivors include three sons, Ricky Lee (Tammy) of Brewer, David Lee (Lisa) of Nettleton, John Lee of Shannon; one daughter, Jessica McLevain (Fiance, Dee Sullivan) of Troy; seven grandchildren, Ashley Lann (Patrick), Amber Hall (Steve), Michael Lee, Brandon Mitchell Lee (Lenita), Brandon Paul Lee (Phyllis), Breanna Lee and Kyle Stafford; eight great-grandchildren, Ashtann, Madelynn, Seth, Kylie, Elli, Connor, Clint and Juleah; two sisters-in-law, Lillene Ballard of Shannon and Judy Ballard of Tupelo; two brothers, Paul Ballard (Ruth Jane) of Conyers, Georgia and Carley Ballard (Patsy) of Shannon; six sisters, Sally Harrison of Fayette, Alabama, Ruth Bruce of Sherman, Mary Nell Gordon (Chester) of New Albany, Pat Warren of Saltillo, Judy Jones (Jerry) of Guntown and Charlene Centanni (Tony) of Thibodeaux, Louisiana. He was preceded in death by his wife, Brenda Ballard; his parents; three brothers, William, Jim and Charlie Ballard; two sisters, Ann Hill and Sarah Wilson. 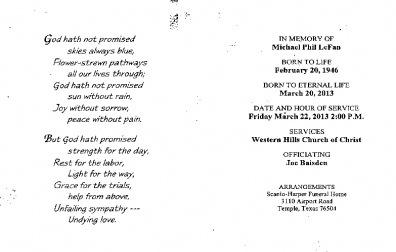 Pallbearers will be Michael Lee, Brandon Paul Lee, Brandon Mitchell Lee, Steve Hall, Patrick Lann, Steven Hilliard, Dee Sullivan, Michael Ballard and Carl Ballard. Visitation will be 2 - 8 p.m. Thursday, April 11, 2013 at the funeral home. Memorials may be made to Shriners Hospital for Children Burn Center in Shreveport, Louisiana. “Ed” Larose, III was born in Babylon, NY and passed away on April 8, 2013. 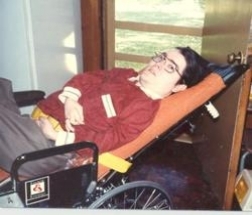 Ed was very active in Ham activities in the San Antonio area and lived in Bulverde TX. He was diagnosed at the VA Hospital with a rare form of Stage 4 Cancer but declined treatment. Ed requested no funeral and the services were private. Clarence “Tootie” Heintschel, Jr., of Port Arthur, Texas passed away Monday, March 25, 2013. He was born July 7, 1941 in Port Arthur, Texas to Clarence Heintschel, Sr. and Clara Powell Heintschel, and was a lifelong area resident. Clarence was an appliance technician and worked for C & D Appliance Repair, he was also past president of Jefferson County Amateur Radio Club. Survivors include his wife of 52 years, Delores Heintcshel of Port Arthur, Tx; two daughters, Cheryl Richie and husband Rickie of Groves, Tx. and Carol Heintschel of Groves, Tx; one son, Gary Heintschel and wife, Nelda of Vidor, Tx; one brother, Williams Glenn Heintschel, Sr. and wife, Pat of Shelbyville, Tx; nine grandchildren, Garrett and Holly Heintschel, Rickie Jr., Monica, Andy, Ashlyn, Dillion, and CiCi Richie, and Devon Sanchez. Funeral services will be at 2 pm, Thursday, March 28, 2013 at Levingston Funeral Home in Groves with Reverend Larry West officiating. Burial will follow in Memory Gardens Cemetery. A visitation for family and friends will be held on Wednesday evening from 5 pm until 8 pm at the funeral home. Mike LeFan was born February 20, 1946 in San Antonio, Texas. He died March 20, 2013. He will be remembered for reasons not trivial because he was special and an uncommon man. He was in a class all by himself. “Victim of polio when he was eight years old”, yet he was so superior to most that the word “victim” seems out of place. Granted, his nights were spent in an iron lung and through the day he used a portable respirator. He did not walk or dress himself and his arms and legs were immovable. The same with his right leg but the left foot was different – he could move his toes. With them he held a pencil, paint brush and telegraph key. He was the fastest operator in our area using Morse code. He typed 40 words a minute on his computer. He had one of the finest vocabularies of any brilliant mind you would ever encounter. He wrote four books. Recognition, honors, and acclaim have been earned by this accomplished Christian. He is survived by his father, James LeFan; a brother, Kevin LeFan; by nieces, Jaima Ferguson and Marla Beimer; nephew Ryan Beimer; and three great nephews, Caleb, Bryce and Grant Ferguson. How happy the angels must have been to welcome him into the Paradise of God. In lieu of flowers, donations may be made to the “Arms of Hope” children’s home, 7065 Love, Quinlan TX 75474. A memorial service will be 2:00 PM Friday at Western Hills Church of Christ with Minister Joe Baisden officiating. Visitation will follow the service. Ed Perkins, 83, of Hillsboro passed away Friday, February 22, 2013, at his residence. Funeral services will be at 3:00 PM Sunday, February 24th, at Marshall & Marshall Funeral Directors Chapel in Hillsboro. Visitation will be from 6:00-8:00 PM Saturday at the funeral home. On October 9, 1929, Ed was born in Hattiesburg, MS to Edward Durham, Sr. and Myra (Roberts) Perkins. In his youth, he lived throughout the South before graduating from high school in Tupelo, MS. He served a tour in the U.S. Navy shortly after high school and then earned his BS degree from Mississippi State University. Following school, he worked for the National Cotton Council for a few years before joining E Systems where he was a field engineer. In his over 20 years of service with E Systems, he worked in such places as Thailand, Viet Nam, United Arab Emirates, Rome and Alaska on defense department projects. In 1972, he married Nell Smith Giles in Greenville. After their marriage, he owned and operated Lafayette Electronics in Tyler until returning to E Systems in 1979 where he would continue until his retirement in 1991. The couple retired to Milford in 1991 and moved to Hillsboro in 1994. Ed had a variety of interests. He was a ham radio operator and often provided public services assistance in times of natural disasters, as well as monitoring for the Iditarod race during his time in Alaska. A licensed pilot, he thoroughly loved anything to do with flying. An avid outdoorsman, he was an active hunter and fisherman. He also included model trains among his hobbies. Preceding him in death were his parents and a sister, Betty Jones. Survivors include his wife, Nell Perkins of Hillsboro; three sons, Edward Perkins, III of Tupelo, MS, David Perkins and Bill Perkins and wife, Nidia, all of Dallas; two stepsons, Dan Giles and wife, Laurie of Milford and Kenneth Giles and wife, Cindy of Garland; five grandchildren, Valerie Perkins, John Thomas Perkins, Kenneth Giles, Jr., Mark Giles and Paul Finley; great-grandson, Daniel Giles; and brother-in-law David Giles and wife, Barbara of Houston. U.S. Veteran Cecil Clayton Cash of Sheridan, Arkansas went to join his wife and be with Jesus on Sunday, January 20, 2013 at the age of 95. He was born January 5, 1918 in Cleveland County near Rison, Arkansas to James David and Mary Anna Cash. Cecil’s family moved to a farm in Sheridan in the winter of 1925. He attended Sheridan Schools. Cecil was saved at Lost Creek Baptist Church in 1935. He was a strong, faithful follower of the Lord for the remainder of his life. During the Great Depression, he joined the CCC and spent time working in Utah and Little Rock. On June 24, 1940, he joined the United States Army and had a 21 year career. While in the Army he was trained as an amateur radio operator and received his privates pilot’s license by attending flight school. After retirement from the Army, he and his family moved to Lawton, Oklahoma, where he worked for Civil Service teaching radio communications at Fort Sill, Oklahoma. He retired after 27 years of Civil Service employment. Cecil married Laura Dean Minor on May 12, 1941. Mrs. Cash passed away on April 2, 2004, just one month before their 63rd wedding anniversary. After her death, Cecil moved back to Sheridan. At the time of his death he was living in Hot Springs, Arkansas. Cecil was preceded in death by his wife and parents, infant daughter Nevolia Dean: sisters, Mary Springer, Mira Brown, Ruby Brown, Lottie Taylor, Lucile Cash and Mozell Williams; brothers, W.L. Cash, Larkin Cash, Dewey Cash, Walter Cash, J.R. Cash, Billie Cash, Frank Norris Cash and A.B. Cash. Mr. Cash is survived by a son, Norris “Skip” (Wrennita) Cash of Hot Springs, AR; two daughters, Cecilia (Mike) Kolb of Austin, TX; Cathey (Glen) Bynum of Broken Arrow, OK; brother, Fred (Shirley) Cash of Perry, FL; Sisters, Earnestine (J.B.) Sanders of Fayetteville, AR; and Trudy (Alton) Carlton of Perry, FL. He is also survived by seven grandchildren, ten great grandchildren, two great-great-grandchildren and his special caregivers Ligia and Aurel Velcherean of Hot Springs, AR. Pallbearers will be grandsons, and grandsons-in-law, Theron Cash, Jeremy Bynum, Philip Taylor and Chris Sanson and sons-in-law, Glen Bynum and Mike Kolb.